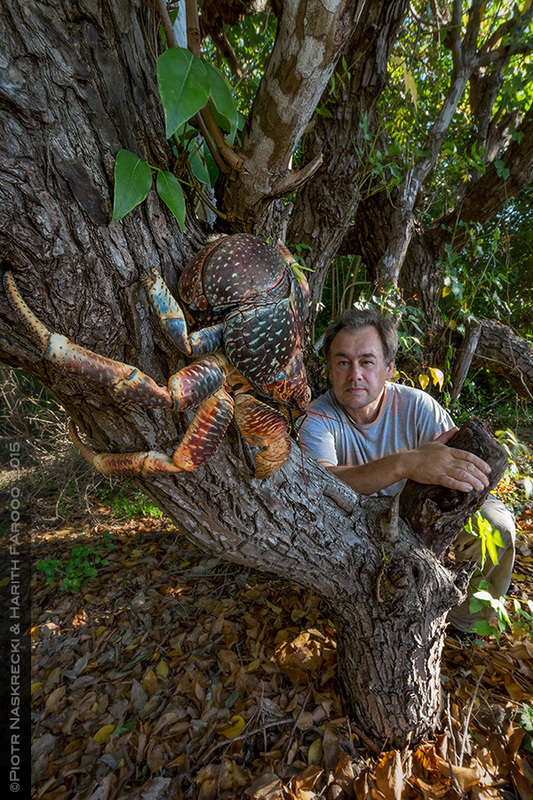 The coconut crab (Birgus latro), the coolest, most awesome, most beautiful inhabitant of the Vamizi Island. These animals have adapted to live around humans and the conservation group on the island does a good job of protecting them. 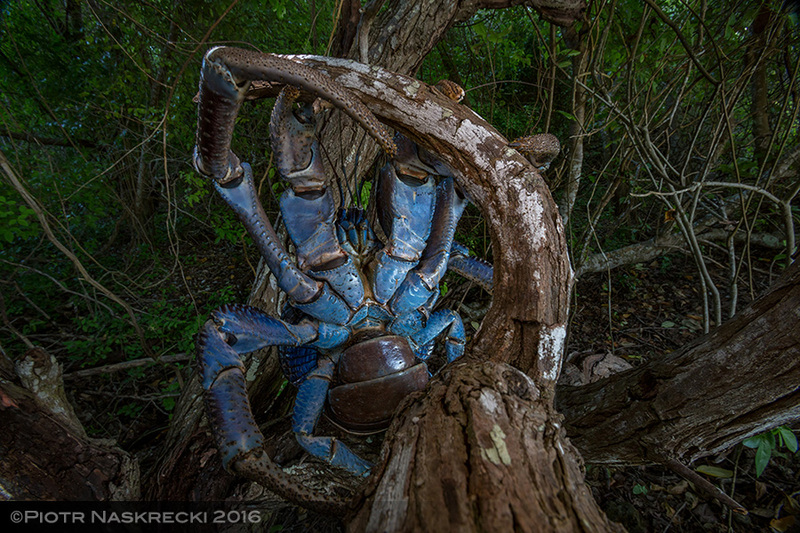 Coconut crabs prefer to be active at night and during the dusk. That is when they emerge from their burrows to look for food. These thoughts ran through my head as I squeezed it into holes in the rugged karst rocks of Vamizi, an island off the coast of northern Mozambique, looking for coconut crabs. Their burrows turned out to be full of coconut shells and other food remains, indicating that a single experiment good science makes not. I had been dreaming of visiting Vamizi ever since my friend Harith showed me a cell phone photo of himself on the island, holding two coconut crabs. All my life I had been fascinated with those magnificent creatures, the largest, heaviest, most awesome of invertebrates that grace the terrestrial surface of the planet. Some years ago I was lucky enough to see these animals alive, first on Guadalcanal, later on Japan’s Okinawa Island, but in both cases they were individuals already captured by somebody else. In those places coconut crabs are on the brink of disappearance due to habitat loss and overharvesting, and I never had a chance to observe them in their natural habitat. 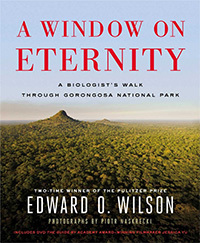 Vamizi, however, a tiny speck of paradise in the Quirimbas Archipelago, still appears to have a healthy population of these animals. 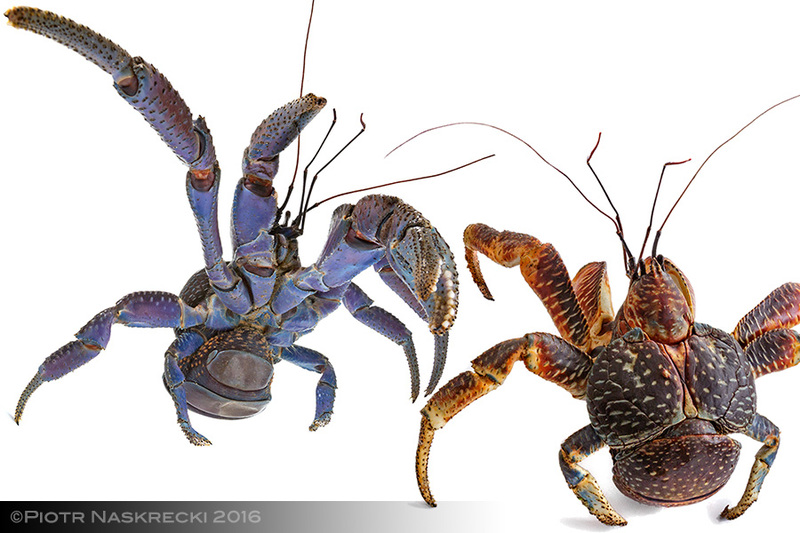 Coconut crabs come in two main color forms, a blue and a red one, both of which can be found in the same population. 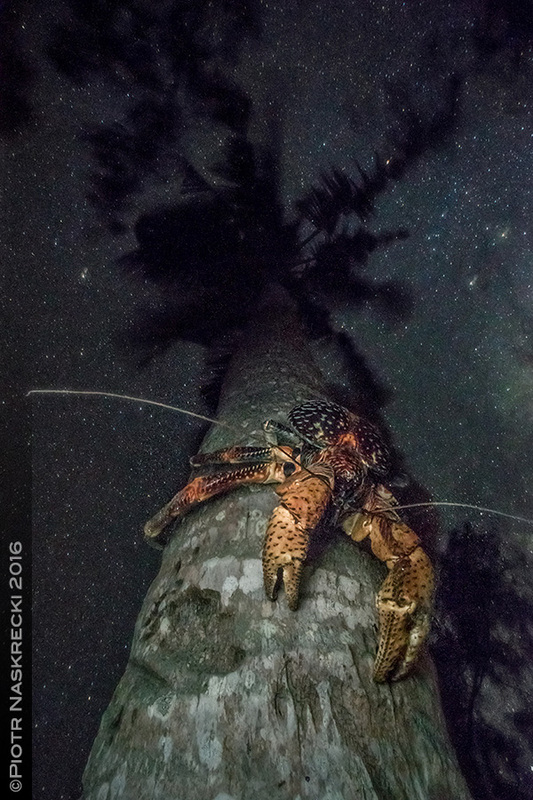 Coconut crabs survive on Vamizi thanks to a clever campaign developed by the good people of the Vamizi Marine Conservation Research Centre. If, they say to the locals who traditionally used to hunt the crabs, you kill one, a terrible spell will never let you leave the island. In a country that is full of many ridiculous colorful myths, this scary thought has apparently kept many from falling to the temptation of the coconut crab’s meat. 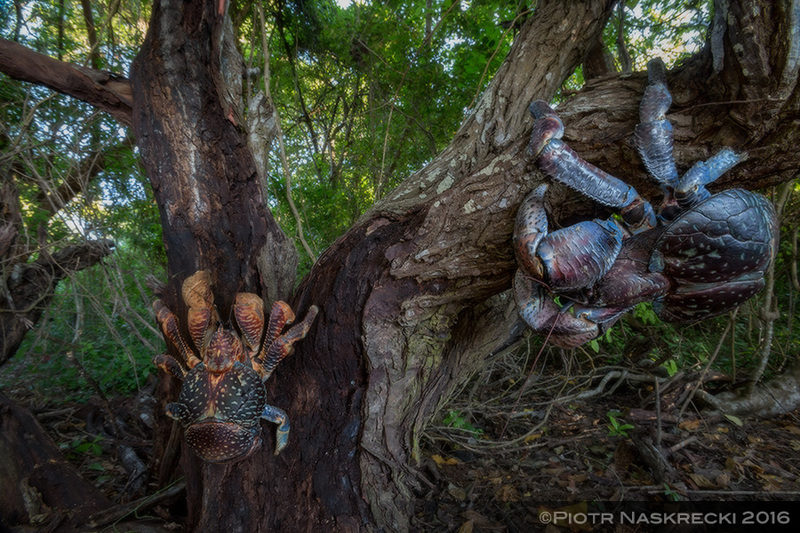 How many crabs survive on the island is unknown but apparently during the wet season it is possible to see a dozen or more coconut crabs on a single stroll through the coastal woodland. I arrived on Vamizi in June, during the cool, dry season, and the locals were not too optimistic about my chances of finding one. (“They sleep now.”) But I didn’t fly to northern Mozambique on the thieving (camera gear was stolen from our checked-in luggage) and occasionally suicidal LAM airlines (go ahead, google it) to leave without seeing a coconut crab. According to Harith the best chance of finding one would be at a place that reliably provides the crabs with their favorite food. No, not coconuts. They prefer something else – fresh garbage. “Take me to the dump”, I asked Harith as soon as it started getting dark. As we approached the island’s refuse disposal site we heard a sound that I would have never associated with coconut crabs – loud clicking of empty bottles. And there they were. Two giant, surprisingly colorful animals, moving among a big pile of glass, looking for edible bits of organic matter. The setting was not natural, it certainly wasn’t beautiful, but I almost choked up when I saw them. 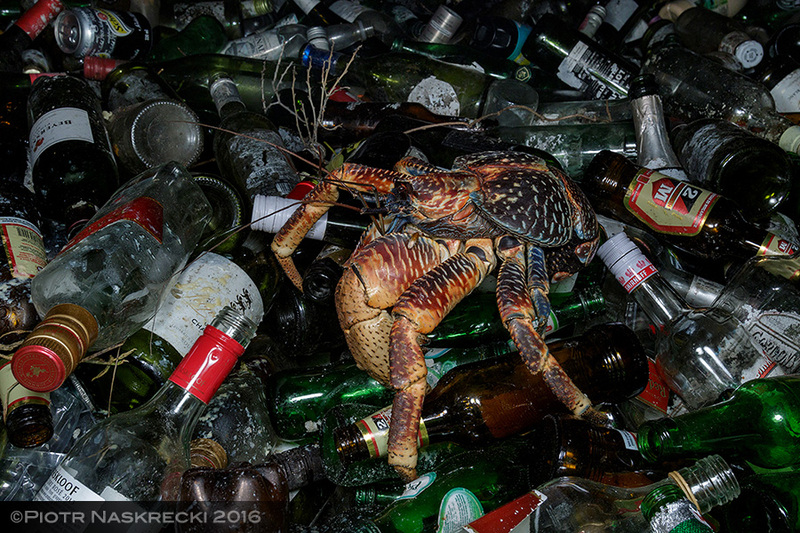 It was at the same time a fulfillment of a life-long dream, to see coconut crabs in the wild, and a sad, disappointing realization that “wild” is a big pile of junk and rubbish, reeking of rotten food and overrun by rats. The Anthropocene, in its full splendor and glory. The Anthropocene – is this what a “wild” habitat should be? Coconut crabs are excellent climbers. Also known as robber crabs, they are known to raid bird nests. I must have picked up and examined about a thousand hermit crabs but, alas, they all turned out to be one of the two local species of Coenobita. A trip to a coconut grove at the opposite end of the island to look for juveniles hiding in the fallen fronds and coconut husks underneath the palm trees was similarly fruitless. That was worrisome. Rats are known to kill juvenile coconut crabs and the island was full of them. We saw rats not only around the houses but also in the most remote, virtually unspoiled natural habitats of Vamizi. One night my friend Max was startled by a gecko that hurled itself towards his head from the very top of a tall tree to escape a rat chasing it on the thin branches. Adult coconut crabs can and will kill a rat, but younger ones don’t stand a chance. Thankfully, the tourism company &Beyond, which operates the phenomenal eco-resort on the island, has been working diligently to improve the situation. 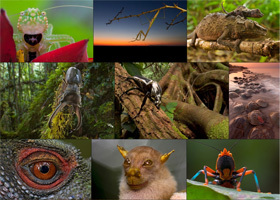 To remove invasive species from Vamizi without harming its native populations of samango monkeys and other small mammals they use specially designed rat-only traps, ultrasonic repellents, and other tools to get rid of the nasty aliens. Every night I spent hours looking for juvenile crabs along the paths in the forest but all I was seeing were very mature adults. On the last night, dispirited by not finding any proof of new blood in the population, I walked further than usual and ended up being out in the field well past 2 AM. Tired and despondent, I decided to have one last tour of the resort staff houses, the most reliable spot for finding coconut crabs at that time of year. There were a few adults milling around but they soon left for their burrows in the forest. That was it. During my four days on the island I did not see any evidence that the animals were breeding. 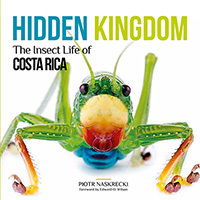 A similar pattern has been seen in other places inhabited by coconut crabs, where the pressure from invasive species, overharvesting, and habitat loss either prevents the animals from breeding or leads to unnaturally high mortality of juveniles. Despite coconut crabs’ longevity (they can live to be 60), with no young crabs surviving the population eventually dies out. I swept the light of my headlamp around, noticing for the first time the fence at the far end of the compound, overgrown with tall, spiky weeds. It occurred to me that I had never checked what lived among them. 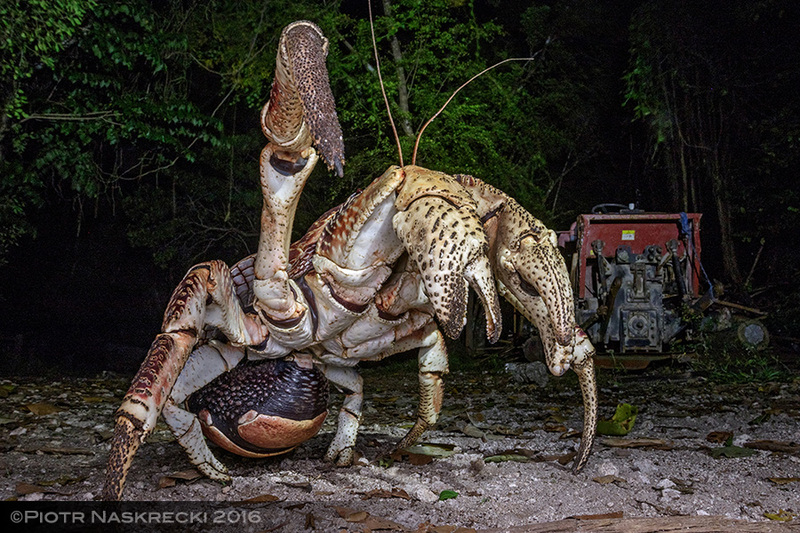 If I were a young coconut crab, would I want to compete with the adults, and risk being eaten, by feeding at the same spot, at the same time of night? I climbed the fence and crawled through the thicket, long, thorny branches ripping my shirt and cutting my skin. The ground below the weeds was covered with Coenobita hermit crabs, frantically gorging on discarded scraps of food. And there, among the hermits, were the juvenile coconut crabs. They weren’t much bigger than the large hermit crabs C. brevimanus common on the island, about 5-7 cm long. I let out a sigh of relief. The presence of young coconut crabs made it clear that the population was thriving, or at least not dying out. And the help they get from the conservation group working on the island will certainly improve their chances. The next morning Harith, Max, and I left the island, having learned not only that it had a good population of coconut crabs, but also that eating oysters directly off the sun baked rocks exposed by the low tide really helps you purge your digestive system. I hope to go back to Vamizi sometime soon and do a more thorough assessment of the crabs’ population. And if I ever perish somewhere near to where these gorgeous animals live, I hope that they find me. 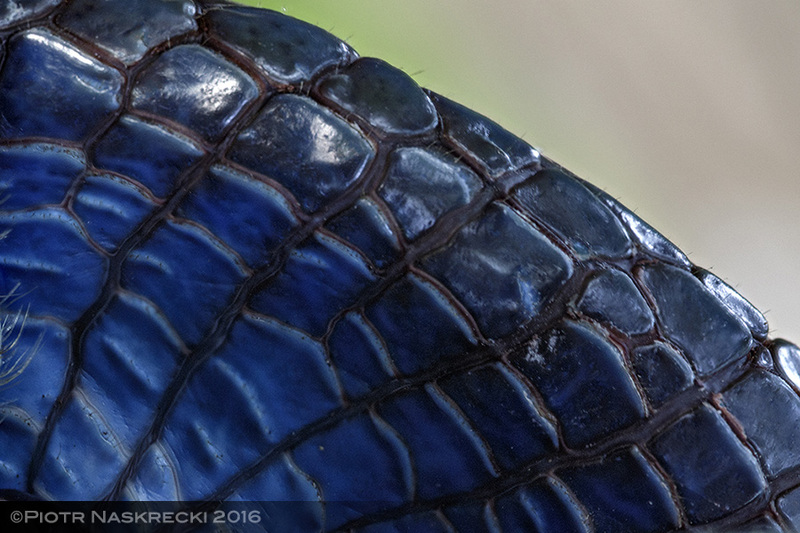 The underside of a blue coconut crab. The edge of the underside of a coconut crab’s thorax looks very reptilian. 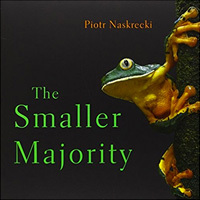 Great story Piotr! Grand moment of seeing the first crabs and sad too, I can comprehend! The blue ones are gorgeous indeed! 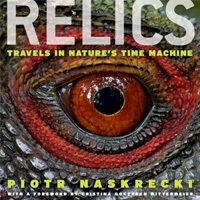 WOW… SO huge and Wonderful… Love the pictures and the information. This is my first time visiting your blog. Gotta say, love the adventurous spirit. Thanks for sharing. Very interesting (and thank you). I am thinking about visiting Vamizi (specifically to see the crabs) – can you recommend any websites re actually getting from the mainland to the island? There are places in Thailand (islands) that still have them as well, let me know if you would like to travel there! Thank you for the post and thanks for stirring up memories. Thirty years ago on Guam a young coconut crab took exception to my ill-advised prodding and clamped onto my thumb. Over the years the scar has faded but the memory remains. Amazing and wonderful creatures, now having trouble sustaining their population on Guam as elsewhere. Beautiful photographs. Love your posts, Piotr. Last winter on the small island of Rodrigues, one hour’s flight from Mauritius– I saw many similar-looking, large crabs who emerged in the mornings and evenings from burrows near a tidal estuary. They sparred over territory. Probably a related species? Cannot find my photos, alas. This was an emotional roller coaster ride for me (and apparently for you as well). I am so glad this story had a happy ending, and I am not referring to the purging of your digestive system. These crabs are incredible. You are fortunate to have seen and photographed them. Keep posting unique stories like this one, please. Wonderful piece, Piotr! Love the Amelia Earhart connection. As usual, great story, great photos. The blue ones are truly amazing, I didn’t know there’s a blue variation. By the way, how does a coconut crab kill a rat… I mean, rats are fast and agile, while these crabs seem rather on the slow and stoic side. Or is it all a ruse? Incredible to see the photo of you next to the crab. I had no idea such huge crabs existed. I hope the conservationists can keep the species going. Great post! And such a blueness in a crab. You are right. Amelia should be this lucky! Love the Anthropocene pic too!